A fine clear Sunday morning and I pulled on the boots again in the first serious outing of the New Year. I started just off the main road at R947 083 D – plenty of room to park a car or two near a field gateway. I followed the road along the Avondhu way leaving it at Knockeennagooneen where I followed a bearing for Farbreaga. Things were fairly foggy as I struck on over Crow hill and down to the road that runs from Araglin, over Doon, down to Clogheen.I picked up the Avondhu way here again and followed it to Knockaglugga where I left it and headed the 750 mtrs north to Knockshanahullion where the weather finally began to clear. There appear to be a few more “standing stones” than there was last year so someone’s been busy. On then to Knockaunabulloga – following the sheep fence (starts at point 551 mtrs approx) around which is easier going than taking the shortest route across the glen. I then headed down the side of Knocknalougha to rejoin the Avondhu way, which I followed back to the start. 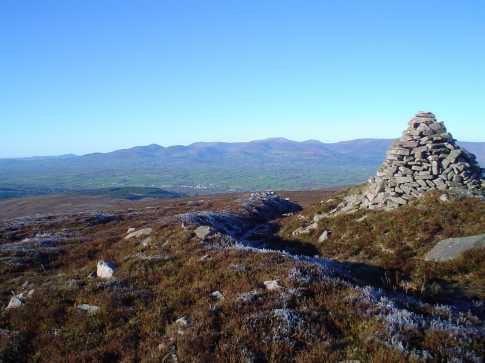 The photo was taken at Farbreagas summit looking across the Tipperary plain to the Galtys. The village you can see below slightly left of centre is Ballyporeen – ancestral home of the late US president Ronald Reagan.